Classic SEM with contemporary improvements. 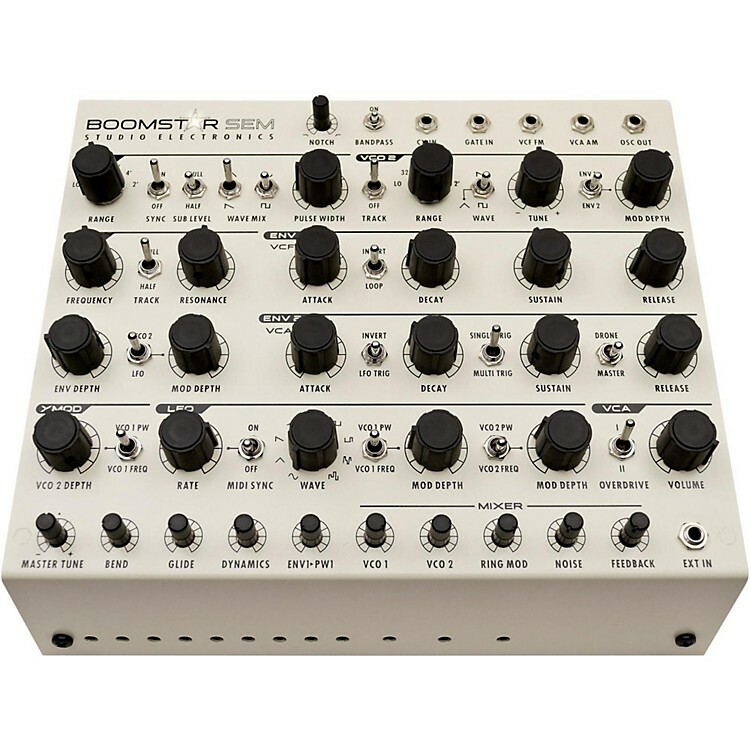 The Boomstar SEM is known as a 'Voltage Controlled State Variable Filter' because it provides simultaneous high pass, low pass, and band pass outputs, all with a 12 dB/oct slope. The notch is the inverse of the bandpass, achieved by summing the low pass and high pass outputs. This version is a combination of the original SEM filter and the newer design from the OBX, along with improvements by SE. It has a modest current draw, which it pulls evenly from the plus and minus rails. This filter is a 'State Variable' circuit, which is an analog computer model of a pendulum. When the resonance is increased, the "damping" or stabilizing of the circuit is actually decreased. This makes the pendulum swing more wildly. If it is hit hard enough, it will swing all the way to one side and 'stick' there, what we call 'bonk out'. Many sound designers like the sounds that can be gotten as it goes into and out of 'bonk out', so Boomstar has not made the filter 'idiot proof' by limiting the input level and resonance amount. If you don't like it, limit your input level and/or resonance amount. Otherwise, go wild! It won't hurt the circuit. Essential for your modular system. Order today.